Ormiston Herman Academy – Clever Cleo! Ormiston Herman Academy > News > Academy news > Clever Cleo! Inspired by her reading book, The Gingerbread Man, Cleo (Pioneers) became a fantastic reading challenge champion! 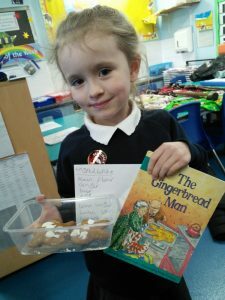 She had noticed that the woman in the book was using a recipe so we challenged her to find a Gingerbread Man recipe at home and to tell us some of the ingredients. Cleo took this challenge and took her learning so much further by writing down the ingredients and then actually baking Gingerbread Men at home with her grown up! Cleo we think your extended learning is deliciously delightful!